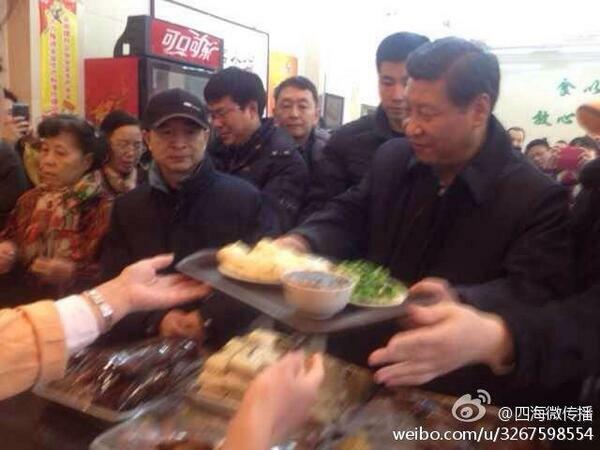 In December 2013 Xi Jinping stepped in line at a Beijing Qingfeng Steamed Bun Shop, ordered lunch, and carried his tray to a table—an early episode in a continuing presidential image-crafting campaign. With a single photo on Weibo, the story exploded online as censors quickly moved to redirect online reaction. While the publicity boosted business at Qingfeng and provided the president with an everyman moment, it also attracted petitioners to the restaurant and drew criticism that Xi was merely putting on a “political show.” A few weeks after Xi’s lunch of steamed buns (bāozi), mustard greens, and stir-fried pig liver—a culinary combination in which netizens tried to divine the political direction of Xi’s then nascent leadership—the State Council Information Office issued a directive for websites to “moderate the ‘heat’” of coverage. Xi’s Qingfeng publicity stunt also earned him the nickname “Steamed Bun Xi” (习包子 Xí Bāozi). Netizen’s wry historical allusions about the famous lunch have been censored in the past. Now, an imperial title and series of regnal dates are blocked from Weibo search results. First is Qingfeng Emperor (庆丰帝), a clear nod to Xi Jinping. Also blocked is first year of Qingfeng’s reign (庆丰元年)—namely 2013, the year Xi became President of China and publicly ingested the buns; second year of Qingfeng’s reign (庆丰二年)—2014, when a crackdown on Party corruption gained momentum, consolidating much power for the Qingfeng Emperor; and third year of Qingfeng’s reign (庆丰三年), the year that is now unfolding. All Xi-related terms originally blocked in January 2014, just after Xi’s trip to Qingfeng, remain unsearchable on Weibo. For more on Xi’s image-crafting campaign, or Xi Jinping in general, read prior coverage via CDT. Anne Henochowicz also contributed to this post.